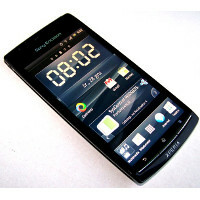 Sony Ericsson Xperia arc S based on the design of the Xperia arc, has a processor speed of 1.4 GHz technology for a panoramic view of the 3D camera from Sony, as well as access to the Sony Entertainment Network - Music Unlimited and Video Unlimited. Xperia arc S has a 25% faster media conversion and 20% faster display of web pages compared with the Xperia arc. Remember that entered PIN on the website must be exactly the same as PIN entered in the setup program on your Sony Xperia arc S.